The Faculty of Education (FEd) of the University of the Philippines Open University (UPOU) conducted the 4th installment of its EDUKussion Forum this time focusing on Inclusive Technologies for Education. The forum was held on 20 February 2018 at the Centennial Center for Digital Learning (CCDL), UPOU Headquarters, Los Baños, Laguna. It featured Dr. Don Passey, Professor of Technology Enhanced Learning at the Lancaster University, UK, and the Visiting Professor of FEd. Dr. Passey shared his expertise on inclusive technologies for education. Teachers from the Basic Education sector within Laguna, and UPOU faculty and staff participated in the event. Asst. Prof. Roja Rivera of the Faculty of Education moderated the forum. In his discussion, Dr. Passey emphasized the importance of identifying first the technology to be used given the diversity of technologies that could be tapped to improve educational practices. He said that the use of digital resources should be focused on the development of the teacher and the learner. According to him, “Technologies are not there in order to keep things as they are. They are there in order for us to move things on and to be able to help other people move things on.” He added that by bringing in technology, teachers and students are provided various ways they could work on to gain positive results. He further elaborated on the ways in which teachers can have access to different types of resources and tackled various digital technology resource examples in primary and secondary education. Dr. Passey identified the five main areas of exclusion namely, physical, cognitive, social, emotional and behavioural, and geographic or locality-based and provided several ways by which technologies address each particular exclusion issue. To address physical exclusion issue, he noted that technologies such as specific assistive hardware and software can help to support physical impairments such as motor, visual and hearing disabilities. For cognitive exclusion, laptops and tablets are widely used because these tools enable writing that will support individuals who have dyslexia or dyscalculia. On the other hand, textual online engagement and video creation are essential tools to address social exclusion. Similarly, video is also an important medium for those who are in the emotional and behavioral group for it not only enables people to see how they can express themselves but also to see how others express themselves. In terms of geographic or locality-based exclusion, this area can be addressed by downloading so that resources can be accessed offline. 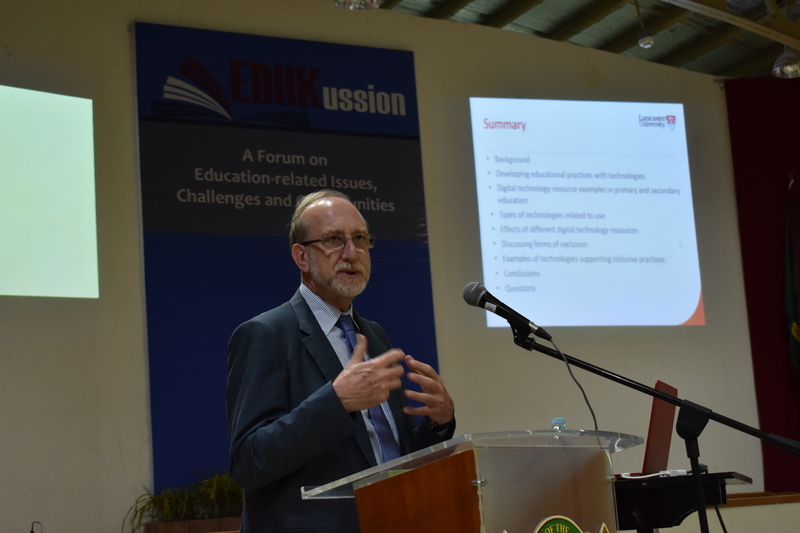 Towards the end of his talk, Dr. Passey emphasized the need to identify a starting point if inclusive technologies are to be integrated into education. “We need a starting point. We need to think about how we’re starting and why we’re starting, and what our future direction gonna be”, he remarked. During the open forum, Asst. Prof. Charisse T. Reyes, Secretary to the Faculty of Education, clarified that the focus of inclusive technologies is not only directed to students with special needs but also aims to serve the more universal learner-audience. She concluded the event with the hope of initiating possible collaborations among Basic Education teachers, Higher Education Institutions (HEIs) and experts to strengthen the interest in promoting inclusive technologies in the classrooms.